Henry Ohye and "Go For Broke" single engine airplane, California, February 9, 1951. 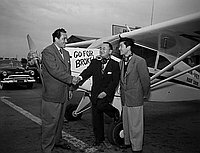 Three men stand in front of white aircraft with "Go For Broke" written on nose. Smiling Caucasian man in suit, left, shakes hands with smiling Japanese man in suit, eyeglasses and earphones around neck; young man in plaid coat and earphones around neck at right. Written on original negative envelope: Henry Onye -- Go For Broke.